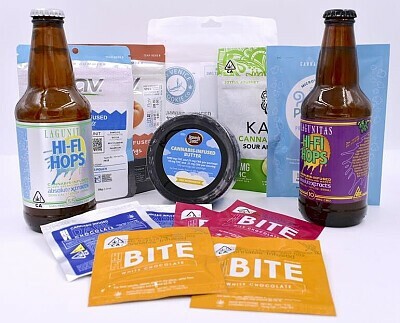 The Edible Package contains (1) Lagunnitas Hi-Fi Hops 10mg THC drink, (1) Lagunitas Hi-Fi Hops 5mg:5mg CBD:THC Drink, (1) Kanha Sour Apple Gummies, (1) Venice Cookie Co. Savory Pretzels, (1) Pop-Up Potcorn CBD, (1) FlavRx Cotton Candy Sour Belts, (1) FlavRx Peach Sour Rings, (1) Heavenly Sweet 1000mg Cannabutter, (2) Hifi Milk Chocolate Bites, (2) Hifi Dark Chocolate Bites, and (2) Hifi White Chocolate Bites. 4/20 Raffle by Empire Health & Wellness: You can buy as many tickets as you wish to increase your chances of winning. There will be 5 winners (5 prizes total). The drawing of the tickets will be held on 4/20 in-store. You are not required to be present to win a prize. First ticket drawn picks what prize they want, then second ticket gets second pick, etc.